What about a thread for all things FJA? We could dump anything here related to the man who, as Ray told me Saturday last, is "responsible for starting me out on my career." We visited him a couple weeks ago, and while we were there, in walked the actor Curtis Armstrong to visit. He offered to interview for the documentary. Forry was looking better than I have seen him since before his illness, and said that he was feeling fine. He said he was about to graduate from the walker to the cane, and that he had just the week prior walked down the street to have lunch at some Thai eatery. Sounds like he's coming right along! Please be aware that Forry is opening hearth and home to anyone seeking Tricks or Treats this All Hallow's Eve, from 7-9pm. Touch here for information. We'll probably pop round, but a little earlier than that, as we may do Universal's Horror Nights that evening at 7pm. 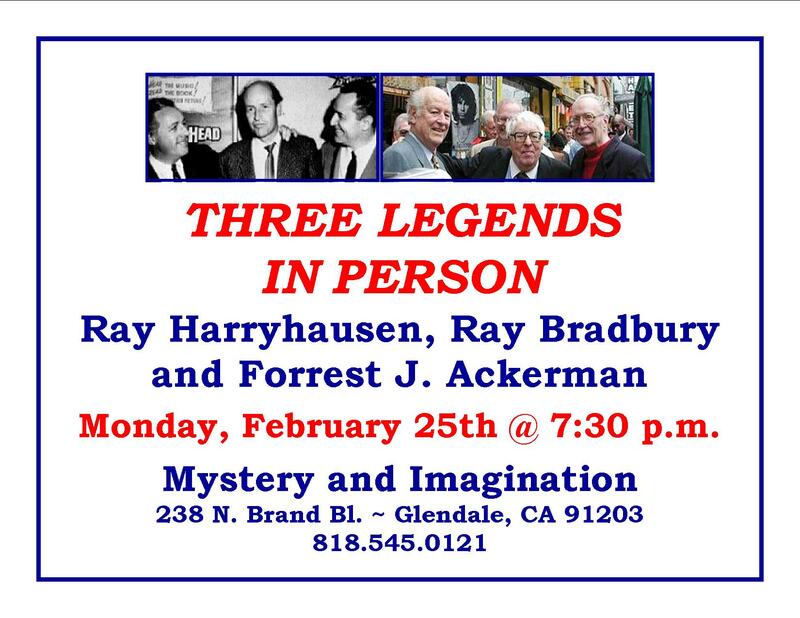 We're trying to talk RB into stopping by on the way back from his noon signing at Vroman's. If we have success, there'll be photos posted. A few photos from the above visit. 4E's protege Casey Wong was there with a drawing for 4E - wonderful! Per Ray's request, I invited 4E to the final performance of Dandelion Wine tomorrow. Got a call this morning from Ackerman who confirmed that he will be going. We're picking him up tomorrow afternoon about 2.15 and taking him to the theatre where Ray will dedicate the performance to him! Then tomorrow night, we're going to the John Michael Talbot concert in LA, but that's beside the point. JOHN MICHAEL TALBOT!!! One of my most favorite! And definitely my favorite Catholic musician. This should be great fun! Good for you that you can attend. Why don't you come with, Mr K? It's at 7pm in Whittier, at Saint Bruno's. I have enjoyed JMT's music for over twenty years, and probably have about that many of his albums going back to his Mason Proffit days. Tomorrow (November 24th) is 4E's 91st birthday - why don't you all give him a ring and wish him a happy one! I'm sure he'll appreciate it (if he can hear the phone). Kewl, thanks for letting us know! The official Birthday Bash will be next Saturday, December 1st. RB is scheduled to be in attendance. I shall post more information when I have it. Well, I certainly don't have his number! I just saw him in "The Sci Fi Boys", with a clip of him saying, "Here I am, George (Pal's graveside), at 86.... I aim at hitting a hundred." By damn, he's doing it! Thank you for a few pictures of visitors at the Ackermansion. There are limited seats ($20 per person) so get there early, and even then there's no guarantee. It just depends on how many are already on the list. I called up Ray's last night and confirmed that he will be there. He's leaving his house at 10am. Traffic, you know. Sorry so late on photos - been out of the house a lot for the last few days. Spent about an hour working up the website's photo album, only to have a stupid error message when I went to post - dumb photo program! This format of displaying the photos seems to be the better way than the one available to the Bradbury website. Gotta use this! These young fellows have found a "Cocoon!" Doug, if the link below is a quite current pic of the 3 Amigos, 4E is really doing well. If this is the case, he has come a long way in several months, in view of the earlier photo of him convalescing (above post). Your visits and cajoling are admirable! We all need to find time to share the spirits of those who have wisdom and grand experiences from prior generations. Your frequent contacts with RB and 4E must be really helping to keep you young! *Today we received a very gracious card and poem from Mr. B (F451 card & Dogs' Christmas) in response to communications from my classes. One of his scary character faces on the envelope and kind words in his message. Quite a guy. When next you visit, our highest regards please extend!